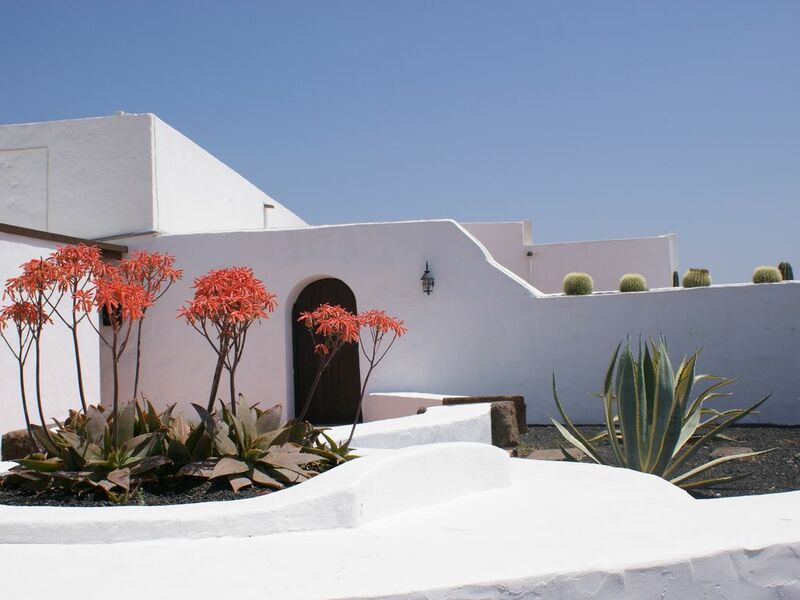 "holidayslanzarote.net" Casa Camella has been completely refurbished and fully modernised by John and Jacky Kennedy, the owners - who own, manage and maintain the property, looking after guests needs personally, as they live on the island. - It has a large garden area, ample car parking space, terraces and a solar heated swimming pool. The house itself has a lovely, shady wooden pergola, perfect for alfresco dining. Inside there are two bedrooms, two bathrooms, kitchen, dining room and lounge. All modern features such as satellite television, DVD / CD player, cooker, microwave oven, refrigerator, dishwasher, etc are included. There is also a laundry room with washing machine and sheltered clothes drying area.. Rurally situated, the house has uninterrupted panoramic sea views with the nearest property 100 metres away. Located in open countryside between Macher and Puerto Calero, it occupies a quiet, private position, yet is close to the restaurants, bars and shops at Puerto Calero marina (2 mins by car). The airport is only 15 mins away by car. Other parts of the island are all within easy reach. A car is an essential but competitive rates are offered on the island by On line local companies such as Cabrera Medina, Autos Reisen, Plus Car and others. John and Jacky Kennedy own and manage "Holidays Lanzarote". They have two villas,one in Macher and another in Soo. Owners Direct supply a service which generates enquires concerning the villas - John and Jacky then contact the enquirer directly and answer their questions / take their booking. They also have their own website where additional information can be sought. John and Jacky now manage over 40 holiday bookings each year in their two popular rural villas. We saw that Casa Camella was for sale on the internet when we were both working on an international development project in Mongolia. Its position was unrivaled with open countryside around it, yet close to all amenities, particularly the marina and waterside restaurants of Puerto Calero. Its potential for development as a fantastic, privately located, rural self catering holiday home struck us immediately. Three years later, completely renovated, became a really popular holiday home for new and our many returning guests.Now, after eleven very successful years of letting we are sure that we made the correct decision. Guests love the house and return again and again. That, we believe is the best testimonial / review we could have hoped for..
Casa Camella offers guests privacy and a quiet holiday location while at the same time being close to all parts of the island. The huge 180 degree sea views are lovely, making the villa, its terrace, heated pool and the open countryside around the house a very special holiday home for couples, families and friends. Bathroom 1 has a washbasin, toilet and walk-in shower. Bathroom 2 has a washbasin, toilet, bidet and a walk-in shower. Se the wifi system and or your mobile phone for communication. We have no telephone handset. Not available - high ceilings keep guests cool in summer - if they want to be indoors! Wood burning stove - see above. All bed linen is provided and changed weekly. We do all of our own laundry - no creased commercial laundry bed linen in our houses! We have a shared (you and us) laundry room with washing machine and sink and also a wind protected drying area adjacent to the laundry. Hand and bath towels are provide and changed weekly. Pool Towels are provided also but are to be retained for use during guests whole stay. A corner mounted woodburning stove provides ample heat in the sitting and dining rooms during any cold snap in the winter - wood can be obtained from the Macher Eurospar supermarket or garage. The fully modernised kitchen has a cooker with extractor hood, refrigerator, microwave oven, dishwasher etc. A range of cooking utensils, glasses, cutlery and crockery etc is supplied, sufficient for a group of up to four guests. A good sized ding table and four chairs are located next to the kitchen in the dining area. A good sized Phillips television and a DVD player (also plays CD's) are supplied. Television signals are received via two satellite dishes. See above, we also provide a selection of DVD's. Some CD's are also provided, located in a basket underneath the TV "cabinet"
The garden in front of Casa Camella makes a lovely entrance to the house and car parking area. Can be hired in Puerto del Carmen around 10 mins by car away. Superb 180 degree uninterrupted sea views from your terrace! Watch cruise liners passing, also yachts and local fishermen. Costa Teguise Golf - 20km away, built by a British course designer John Harris in 1978. A mature and attractive 18 hole course with sea and distant extinct volcano views together with full grown Canarian Palms providing shade. The late, great Seve Ballesteros described it as the most challenging in the Canaries - some testimonial! Puerto del Carmen Golf Resort - 10km away at Tias, recently opened. 18 holes - an excellent new development by the well known island family Rosa who own the Playa Blanca marina, Bodega Stratus in La Geria, La Tegala restaurant at Macher. Eveything they do is of excellent quality - the golf course is no exception! Also great "après golf" meals and snacks at "Hoyo 19"
The pool is heated by solar and a heat pump during winter months. It is 8 x 4 metres (length / width) and accessed by steps at one end. A flosating pool cover retains heat at night always and winter. We had a wonderful 2 weeks at John & Jacky's villa. The location is great and the villa is even better than in the pictures. We have stayed in several villa's in Lanzarote and this one is the best. Everything you could ever need for a relaxing holiday is provided. Theres's great space for the kids to play in and a locked gate for the pool. Then when the kids are asleep there a great seating area for the adults to enjoy the evening. John and Jacky were on hand to deal with any issues and give advice. I would definitely recommend this villa to families with young kids. Our 2 boys are 3 and 4 and they loved it. James, Bernice, Cillian & Sam. We are so pleased that you all enjoyed your holiday at Casa Camella and thank you for both your custom and the lovely review that you have written. As you know - to be confident that you will receive what you see in the advertisement when one books a holiday is extremely important and reviews such as yours help immensely to raise that level of confidence. We will be delighted to host you and your family again in the future at any time! The villa is in a great location 2 mins drive from our favourite Puerto calero and really accessible for the supermarket, airport and loads of other places! The villa itself was spotless and really well maintained, the pool was lovely although it was a bit too windy to go in every day. I'm sure we'll be back! Being on the island and managing everything ourselves ensures that a five star standard is maintained. As we said when you departed, you know that you will be very welcome here in future. True, it was a windy week, a breeze is nice but during that week was more than people expected - more than we expected too. At least you were not holidaying in Turkey during that dreadful coup. Lanzarote is, as they say, "tranqillo"
Thank you Clive and Anne. We are delighted that you enjoyed your holiday and that you are considering returning again this year. You were lovely guests and it was a pleasure to host your holiday. I can only endorse last year's review - Camella is a lovely holiday location. We had another marvellous holiday here (our 5th) - our very favourite villa. Weather was excellent, the villa is set in a beautiful location, offering an ideal combination of peace and privacy but with all the facilities of Puerto Calero just a few minutes drive away, including boat and submarine trips and a good variety of cuisines in the many restaurants. John and Jacky are perfect hosts - there if you need them, but not if you don't. Looking forward to our next visit. Spent 3 weeks at Villa Casa Camella. The accommodation was really nice, sea views excellent and beds extremely comfortable. John and Jacky were very helpful as they were always on hand because their house backs onto the end of the pool with their bedroom under the raised patio. We shared the laundry facilities with them and often saw John gardening around the villa. Their two dogs were not particularly noisy, nor the main road between Macher and Puerto Calero which the villa fronts sideways onto. The standard of cleaning was disappointing. Where to start? well, to kick off, IF you´re wondering whether to book - just do it, cos you´ll not be disappointed here. To be honest we´re a bit picky (a tad difficult, i´ve been told) and this is one of the very few places we´ve ever returned to. Again and again. 2014 was our 5th (or 6th??) visit and we´ll be back again soon for sure. Frankly we never want to leave! Casa Camella is the perfect destination for friends (works well for 2 couples), families and twosomes (superb honeymoon or romantic destination) and delivers far more than promised. The helpful and courteous hosts make booking a cinch and are there if you need them while always respecting your privacy. We specifically book holiday homes to get away from "the herd" and here we are totally undisturbed. This lovely house is impeccably maintained and spotlessly clean and combines old Canarian charm with a great deal of contemporary flair. Comfortably furnished with quality fittings. Lovely colour scheme. Great details. The location is quiet and peaceful with gorgeous views over the lava fields down to the sea, away from the crowd but within easy striking distance of both the exclusive yachting enclave Puerto Calero (bars, cafes, restaurants, boutiques, marina) and the beaches, shopping and nightlife of vibrant Playa del Carmen. You can of course (and we often do) prepare your meals in the well equipped kitchen or outdoor bbq/cooking station, but there are many great places for dining out or picking up a takeaway (Local, Italian, Chinese, Thai, Indian and much more) just down the hill or in nearby villages. Plenty of info on this and further activities are provided. There are books, games, DVD´s and a generous welcome pack. You´ll be torn between the fabulous high ceilinged master bedroom and the slightly smaller double with lovely views over the pool, the sea and all the way across to Fuertaventura. Comfy beds, plenty of hanging space (and lots of decent coathangers!). Both bedrooms have good sized shower rooms and loo. and so to the pool....what a treat to have your own private heated pool. Sun or shade, pick your spot, from sunrise to sunset. Those fab views again which can also be enjoyed from the upper and lower terraces. In reality much better than the pics! . Stargazing? Oh yes, that too. Glorious nightskies here. Would i recommend to my best friend? I most certainly would, along with family, colleagues and now here too. Go on, get it booked. But don´t you dare take "our" weeks! Many activity sports can be enjoyed on Lanzarote from road cycling to mountain biking, surfing, kite boarding, sailing, fishing, diving, hangliding, walking, painting and photography. We can make enquiries for you or simply put you in touch with a selection of appropriate organisations - which ever you wish. For walkers there are well marked trails - also look at "Walk Lanzarote" by David and Ros Brawn - a great guide, GPS ready, well used by walkers that stay with us. Lanzarote is famous for its annual 'Ironman,' also 'Ironman 70.3' and 'Tres Islas' triathlon races - simply watch these gruelling events or for seasoned triathlon competitors, why not join in! The coast at Puerto Calero marina is 2 mins away by car - literally just down the hill in front of Casa Camella.. A number of good restaurants overlook the marina. The submarine safari which departs from there is amazing. Deep sea game fishing, sailing and scuba is all available there. Puerto del Carmen with its white sandy beaches is 5 / 6 mins away by car. There are plenty of designer shopping opportunities too! The island's airport is at Arrecife, where frequent charter flights arrive every day from all over Europe bringing holidaymakers to this different and beautiful island. Holidaymakers from UK can get to Lanzarote six days weekly, via Easy Jet, Ryanair, Monarch, Thomas Cook, Thomson and others with Wednesdays usually taken up with German and other European flights. There is a local Eurospar supermarket located at the Macher island on the LZ2 main road - of a good size and very well stocked - opens Mon - Sat, from 8am until 10pm and also on Fiestas. Also very convenient is the supermarket at Macher garage. It is well stocked but has no meat, fish or delicatessen counters. I opens until late, including on Sunday mornings. There are large supermarkets in Playa Honda and Arrecife) HiperDino, Eurospar, Aldi. Mercadona have opened several supermarkets on th island, the nearest of which is at Playa Honda, near the airport. Puerto Calero marina has lots of restaurants and bars to choose from, with Puerto del Carmen only a few minutes further with everything from banks, chemists and estate agents to bars, restaurants and night clubs. We can suggest lots of special places to go and eat / visit etc. Booking Notes: A booking is secured when a 30% deposit to be paid into our UK bank account (or the equivalent percent in Euros into our Spanish account), after which, a confirmation document / receipt is issued as an e-mail attachment. An invoice is provided in time for you to make your final payment which is due 6 weeks before scheduled commencement of your holiday. Payment is to be made by the same bank to bank method. There are NO hidden extras. We do not accept credit cards. Changeover Day: We prefer a Thursday changeover but are happy to be flexible where possible. Please ask. Arrival not before 2pm and departure by 10am - although bags can be dropped off if you advise us beforehand that you will want to do that. Notes on prices: Extra nights pro rata. For Jan 2019 to end December 2019 the following prices apply: Current prices in Euros are also shown: Up to 4 guests £131 per night (€144) per night The house sleeps four and prices are based on up to 4 guests sharing. Children: Up to 2 years old (we have a cot, baby bath and high chair) free of charge A 30% deposit is required at the time of booking. Final balances are due 6 weeks before your holiday arrival date. Note: 2 guests wishing to use 2 bedrooms please ADD ·sterling pounds 45.00 per week Cancellation: - Guests which cancel a booking up to 6 weeks before their scheduled arrival date will only forfeit their deposit. After that date and prior to 30 days before their scheduled arrival date 50% of the total value of their booking will be forfeited. After 30 days prior to their scheduled arrival date 100% of the value of their booking will be forfeited. Clients are seriously advised to take out adequate travel insurance protection to cover delayed and cancelled flights, also events that cause them to have to cancel their holiday plans. We are not responsible for events beyond our control which effect their ability to take a holiday, previously booked with us.